↑ (1991) Historical Dictionary of European Imperialism. Greenwood Publishing Group, 109. ISBN 978-0-313-26257-9. ↑ 2.0 2.1 Alan Rayburn (2001). Naming Canada: Stories about Canadian Place Names. University of Toronto Press, 14–22. ISBN 978-0-8020-8293-0. ↑ Paul R. Magocsi (1999). Encyclopedia of Canada's Peoples. University of Toronto Press, 1048. ISBN 978-0-8020-2938-6. ↑ Great Britain (1841). 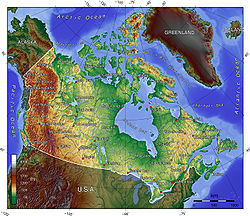 An Act to Re-write the Provinces of Upper and Lower Canada, and for the Government of Canada. J.C. Fisher & W. Kimble, 20. ↑ (2008) Archaeology in America: An Encyclopedia 4. ABC-CLIO, 3. ISBN 978-0-313-02189-3. ↑ Timothy R. Pauketat (2012). The Oxford Handbook of North American Archaeology. Oxford University Press, 96. ISBN 978-0-19-538011-8.